This studio cabin is perfect for a glamping retreat for two in Upstate New York. With homey furnishings, glampers are assured to have a cozy stay. 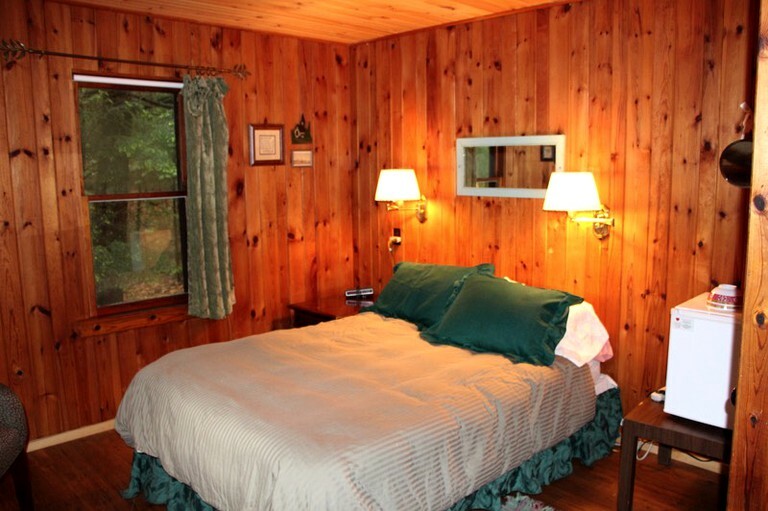 This pet-friendly Adirondack cabin located amidst forested preserve and is available nightly from spring to fall. It is not on the water but guests have full access to Kiwassa Lake, just 75 inches away. Guests will enjoy access to Kiwassa Lake with dock space for a boat or canoe as needed. The cabin also offers a wraparound deck with picnic table and charcoal grill. 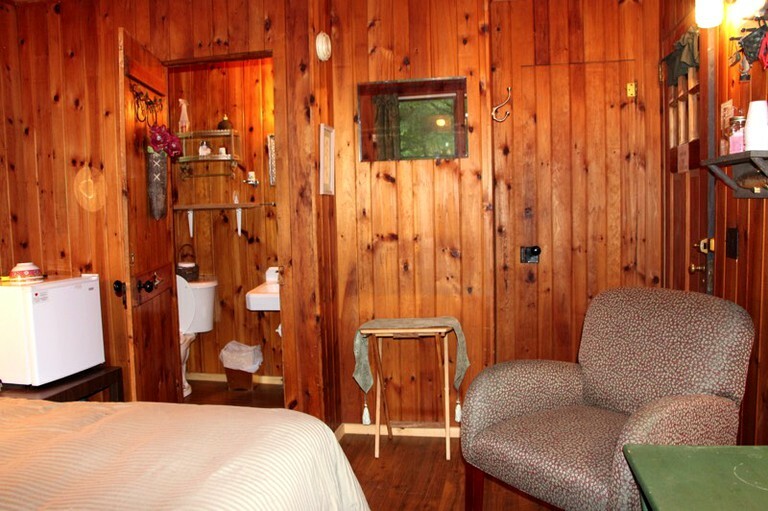 This one room cabin rental has a double-size bed and a private bathroom with a toilet, a sink and a shower stall. Linens, including pillows, blankets and towels, are provided and other amenities include a love seat and a chair for seating, a coffee maker, a small fridge and a set of dishes. 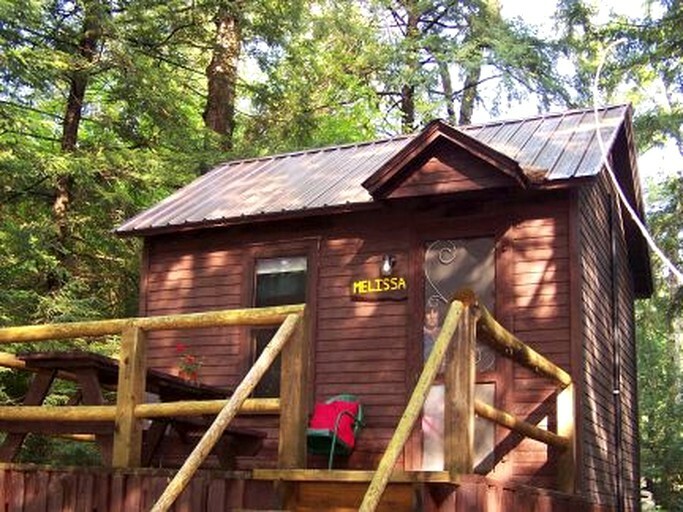 All of the cabins are located on Lake Kiwassa and Kiwassa Outlet surrounded by more than 20 acres of woodlands. Pet sitting services can be arranged but advance reservation is required. Requests for pet sitting upon short notice is very difficult to accommodate. In summertime, glampers can go mountain climbing, hiking, canoeing, and boating. There are also free concerts in Riverside Park and Berkeley Green Park in the summer in Saranac Lake. All types of skiing and cold-weather sports are popular in upstate New York in the winter—downhill and cross country skiing, snowmobiling, snowshoeing, and ice skating. There’s even a local winter carnival to celebrate the colder months of the year with a different theme every year. 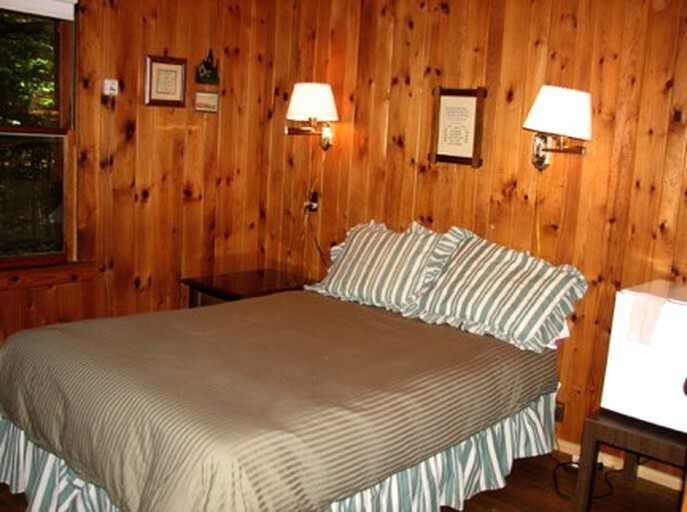 From Cochran's Adirondack Cabins, guests are able to travel from Kiwassa Lake, by boat, to the Village of Saranac Lake, via the Saranac Lake Chain of Lakes. The popular Adirondack route from Kiwassa Lake will take glampers through Oseetah Lake into the Village of Saranac Lake where the Saranac River begins. Guests may also enjoy a waterway trip 40 miles through scenic Adirondack lakes, ponds, rivers, streams and go through New York State lock systems into the Adirondack State Preserve. After, during or part of a stay, take a canoe/camping trip. Park the car at the glamping site and the hosts will then drop glampers off with their gear, including canoe/kayak, at Lower or Middle Saranac Lake. Paddle back the same day and enjoy the Adirondack island. The Adirondack Mountain region offers 689 lakes and ponds. and the glamping site is located on Kiwassa Lake, which has access to the Saranac Lake Chain. There are 46 High Peaks in the Adirondack Mountain region with many experienced hiking opportunities. If in search for something simpler, local hike, Mt. Baker may be a good start. Approximately one mile up and one mile down, the base is minutes from the cabins and the summit offers views of the Village of Saranac Lake. All daily cabin rates are listed for double occupancy, and the cabins have a minimum weekly stay requirement during the summer. Please contact the host about a list of things to bring along to this glamping site. A security deposit is required, and the amount varies depending on the property. If guests are flying into the area to go to the glamping property and cannot bring their own linens and towels, please ask the host if linens may be available for an extra fee. There is no cleaning fee at this property, because guests are expected to leave the accommodation exactly as they found it. If these standards are not met, the security deposit will be forfeited.